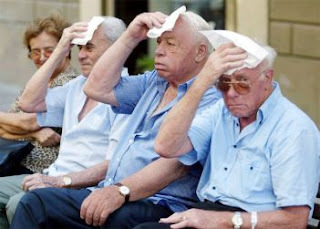 The l'afa blankets Rome with temperatures hovering around 100˚ F. (37 C.)—and humidity to match. Afa is the Italian noun identifying muggy weather, but the English noun mugginess doesn’t really describe the situation here. There’s an unrelenting heaviness to the air that saps your energy. It’s like wearing a steel suit with a mask to restrict breathing. Most Romans, indeed most Italians, have escaped to the sea or the mountains. Many shops, many stalls at the markets, many businesses are closed. The streets have fewer cars, the busses fewer riders. Those of us still here are moving slowly, staying indoors until dusk. Mosquitoes are the only things traveling with any speed, and even they lack their normal velocity. When we finally amble out as the sun approaches the horizon, we head for the one shop guaranteed to be open—the gelato store. At this time of year, bars usually have at least a few gelato selections, many pastry shops also carry it, and some shops are devoted exclusively to it. While all are good, the best comes from establishments boasting “la nostra produzione,” (our production) or “gelato artigianato” (handmade ice cream). 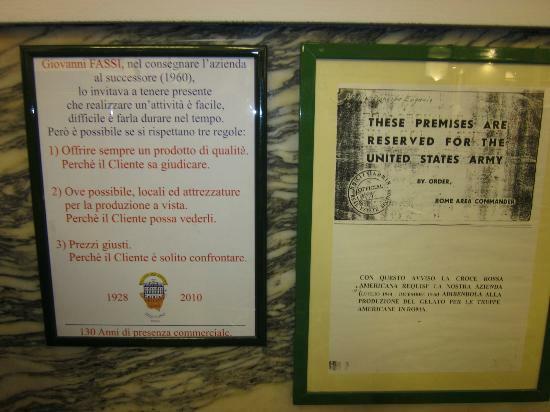 Some shops exhibit plaques showing membership in the Handmade Ice Cream Association of Rome. They are your best bet. The oldest ice cream store in Italy, the Palazzo del Freddo (the Palace of Cold), dispenses gelato and other frozen treats to crowds. When the store opened on May 12, 1928 by Giovanni Fassi amid much fanfare, the Palazzo del Freddo was touted to be the most modern such facility in Rome—and perhaps in Europe. According to contemporary advertising, it had the newest mixing machines, the best refrigeration, and the finest ingredients to be found, with an owner boasting 40 years of experience. It’s still one of the best. It is an enormous establishment, by Italian standards, in a once elegant neighborhood; the walls and tables are made of marble from Pietrasanta; mixing machines from the 20’s and 30’s are on display; and posters and newspaper accounts from throughout its history line the walls. From the latter you learn that Giovanni Fassi was the son of Sicilians Giacamo and Giuseppina Fassi who came to Rome and opened a small beer and ice shop in Piazza Navona in 1880, changing locations a couple of times and expanding to gelato production before Giacamo died in 1902. Giuseppina and son Giovanni carried on the business until Giuseppina died in 1913. Giovanni continued alone, and opened the current shop on the 15th anniversary of his mother’s death in 1928. He proclaimed then that everyone would remember his mother on that date in the future. One of its components in the early days of the store was Telegelato Giuseppina, “the gelato packaged to carry great distances.” One poster from the 1930s advertising this feature shows a family in a convertible carrying a large box of Giovanni’s gelato. 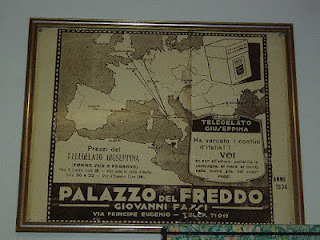 It reads “to the beach, to the mountains, in all of Italy.” It was even possible to have the gelato packaged and shipped to north Africa and across Europe! Even today, Romans stop by the Telegelato counter to have ice cream hand-dipped into great tubs and packed in dry ice for the trip home. You can also get various types of ice cream cake thus packaged. It’s guaranteed to remain frozen for an hour without refrigeration. 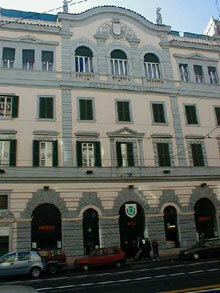 One of the most curious elements of the Palazzo del Freddo’s history occurred during the American occupation of Rome in World War II. 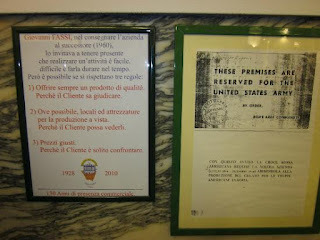 A notice now on display reads “These Premises Are Reserved for the United States Army By Order Rome Area Commander.” A note accompanying it reads, “with this notice our business was requisitioned by the American Red Cross from July 1944 to December 1946, and used for the production of gelato for the American troops in Rome.” If the Red Cross made the gelato according to the Fassi family recipe, the troops were well fed indeed! Reading your posts always make me jealous. I tried to place the ice cream shop on a map in relation to where I lived in Rome. I don't think it was far, probably walking distance, but I don't remember it. It was a long time ago. Now, if I ever return, I'll be sure to go there. It's near Piazza Vittorio--not an elegant neighborhood now, but at one time it was. It's not on tourist maps. I stumbled on it when I spent time teaching at a nearby high school. When they celebrated their 100th anniversary (which included the years of the beer and ice stand), Rome's then-mayor Walter Veltroni attended. What a great story, Patricia! A fascinating bit of Roman neighborhood lore. Makes me want to run to the freezer!